BBVA and BBVA Bancomer are piloting an FX matching application developed by Calypso Technology, a leading provider of cloud based cross asset trading software solutions for the financial markets, and enterprise software firm R3. The application, which runs on R3’s Corda platform and is facilitated by Calypso’s cloud services, has already been used by the two banks to match a test FX trade. What started out as a banking operations seminar in 1978, has become – 40 years later – the premier business forum for the global financial community. Sibos is a congress organized by SWIFT, where every year financial institutions from across the world discuss and analyze the latest developments in the banking sector, with a special focus on innovation and technology. This year, BBVA will set out its vision about one of the most potentially-disruptive technologies for the world of finance, also one of the hottest topics of this year’s Sibos: blockchain. On Thursday 19, Head of Digital Transformation, CIB BBVA Alicia Pertusa will participate in a panel that will try to find the answer to a question: Does blockchain technology alleviate security concerns or create new challenges? The panel, moderated by Hyperledger’s security expert, David Huseby, will discuss blockchain’s implications for cibersecurity in financial services. Drawing from the knowledge afforded by the different proofs of concept and pilot projects involving distributed ledger technologies (DLT) to which BBVA is contributing, Pertusa will talk about the challenges that need to be faced to successfully implement this technology in an organization’s internal processes and maximize security under all possible scenarios. “Distributed ledgers, artificial intelligence, robotics, biometrics and cloud computing are some of today’s most relevant disruptive technologies. 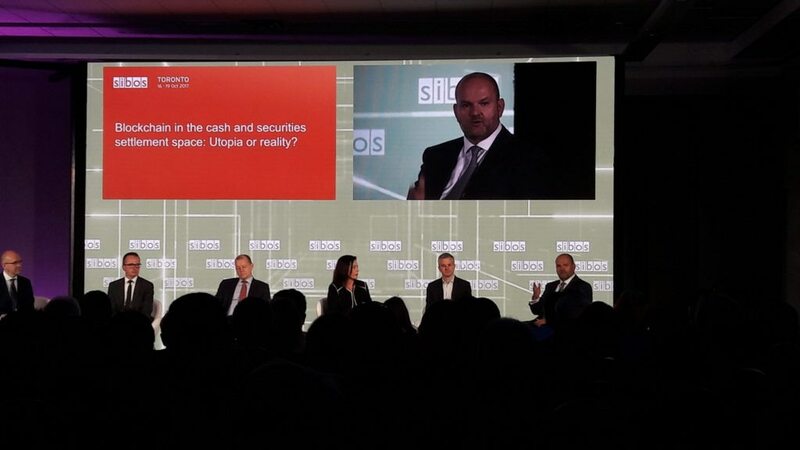 Our role is to bring disruptive technologies to specific projects for the benefit of our clients,” explained recently Alicia Pertusa in an interview with Sibos Issues, the event’s official publication. BBVA’s representative will be joined by four experts from financial companies, fintech startups and DLT service providers: Thomas Zschach, Chief Information Officer at CLS; Ikuma Ueno, Head of Blockchain/DLT initiative at Mizuho Financial Group; Tom Jessop, President of Chain; and Blythe Masters, CEO of Digital Assets. BBVA started working with blockchain four years ago and is currently a member of three consortiums exploring the technology’s potential: R3, Hyperledger and EEA. These partnerships are essential to make headway towards the creation of common standards and build efficient and safe platforms that allow leveraging the advantages of DLT in the corporate world. As part of this commitment, BBVA has collaborated with R3 in a number of projects, including the development of a platform to redesign the infrastructure of trade finance operations through smart contracts, the development of an app to expedite import-export transactions and the creation of a blockchain-based identity management system. Also, BBVA and BBVA Bancomer are taking part in DLT-based FX matching pilot and in April 2017 BBVA performed the first international transfer pilot test based on Ripple’s DLT technology. BBVA's Alexis Thomson participated in a panel called "Blockchain in the cash and securities settlement space - Utopia or reality?" The panel, comprising representatives from BBVA, BNY Mellon, The European Central Bank and Payments Canada, were cautious about the implementation speed of the blockchain technology in the securities business. While the panelists were all convinced about blockchain’s long-term potential, they had many concerns such as the cost of adoption, maturity for large-scale applications and political and regulatory hurdles. Alexis Thomson pointed out that “although the blockchain technology may be able to offer improvements in the settlements speeds, the industry is not ready for it yet. He also emphasized the importance of still exploring the capacity and potential of existing platforms in which many companies have recently made huge investments, especially in Europe”. BBVA is one of 11 banking institutions that are collaborating on the development of the Voltron project, a platform based on DLT (distributed ledger technology) that puts exporters and importers in contact, in order to improve efficiency in trade finance.